The National Certifying Examination for Surgical First Assistants covers the knowledge and skills common to competent entry-level Surgical First Assistants in varied settings and geographical locations. NBSTSA committee members designed the examinations to assess the skills that comprise the core body of knowledge for all surgical technologists and surgical first assistants. The CSFA examination examines practical knowledge, and one night of studying will not lead to passing grades. Read through the Examination Content Area Outline (Effective 1/1/2019). All the areas listed may appear on the examination. As of January 1, 2019, candidates must correctly answer 105 questions to pass the CSFA examination. There are 175 questions on the test, 150 of which are scored, and 25 of which are being tested for future examinations, and do not count for or against the individual taking the test. Mark those areas with which you are not familiar or comfortable. Study those areas, or possibly attend a class or seminar. Remember the CSFA examination is a broad knowledge based examination that does not test in one specific subject area or surgical specialty. Read through the reference list (found in the candidate handbook). These references are the primary sources of information used when the examination questions were developed. Use these references to review and refresh your knowledge, particularly in the areas you identified as unfamiliar when you reviewed the Examination Content Area Outline. Call and schedule an appointment as soon as you are ready to test to increase the chances of getting the time and date you want. Saturday appointments fill quickly. Know the location of the test center, including parking areas, as well as the actual location of the test room. If necessary, call the test center facility to get directions. You will need your identification for admission to the test. Prepare them the night before so there are no surprises the day of the examination. The CSFA Study Evaluation will help give you an idea of what topics to focus your study time on. Click here to fill it out. Review the current CSFA reference textbook list. Take the CSFA Practice Examination, available through the NBSTSA. These examinations are computer-based simulations of the actual CSFA examinations. Candidates will receive an analysis of individual questions and performance. The cost to take the practice exam is $40. Study anytime, anywhere! 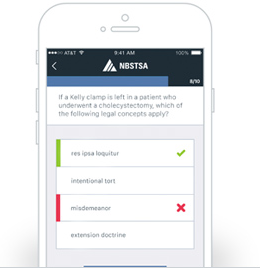 Download the official test prep app for the CSFA examination. Available on the App Store and Google Play.